May I copy your memorial art work for. Jodi – to post on my FB page please? No problem. But it’s not actually mine anyway. I just saw it on twitter and saved and re-used the picture. Maybe I should have asked for the ok to use it in my blog – but didn’t think. And I can’t remember who tweeted it now. ” died of breast cancer that could not be treated because her body was so weakened by ME ” . I don’t think this was a quote from her actual death certificate. But it was a statement that was widely circulated on Twitter. And probably other social media like Facebook. 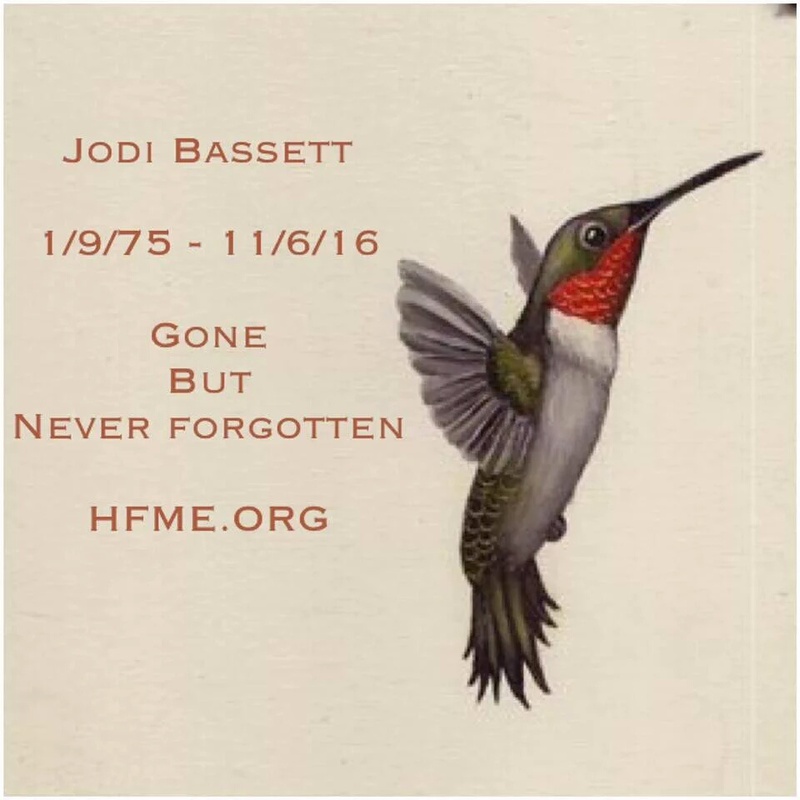 I have no way of knowing if the cause of Jodi’s death quoted is 100% correct of course – but I’m sure it will be. I am one of those at HFME and while we have not been able to update the website, we have updating the HFME Facebook page, and requested people making such statements to delete them. But it was very hard, needing to do this in the first week of her death, while we were barely up to discussing it, and the funeral was still happening. In my opinion, it is better to make more general statements about the problems of dealing with the combination of M.E. and cancer, than assertions about individuals, because while they are likely to be correct as general patterns, they aren’t always with individuals. I don’t know what treatment Jodi was doing, but she was getting treatment. Sadly, it did not cure the cancer, and the combination of the cancer and M.E. was too much for her. Yes, you are quite right in what you say. And I sincerely apologise for any distress caused. The comments on Twitter that were being widely circulated, I’m thought said they were taken from Jodi’s Facebook page. Or from Hfme’s page. But that is no excuse I can see. I guess I just jumped in to wanting to raise awareness too quickly. But lesson learned. I deeply apologise for distress caused to the family. If some of what I wrote sounded a bit casual – I’m really sorry. I didn’t mean it to. But on reading it back now – I can see that it maybe did. I’ve amended the post a wee bit now and added a “see comments” note to 2 areas. But I’m wondering if I should actually just delete the whole post ? I’m struggling today, so I will leave it on just now. Overnight anyway. Have now amended this blog post. As you were right in what you said. And the last thing I would want to do is cause even more distress to the family. And I’m really sorry if I did that. I probably jumped in too quick with trying to raise awareness. I’ve been slower amending this than I would have liked. I’d actually have liked to type a better post. But unfortunately I just can’t manage that right now with all my ME symptoms.